Tropical mermaid ornaments are elegant and whimsical. Mermaid ornaments and decorations add a mystical touch to your holiday celebration. The decorations for this Christmas tree theme feature whimsical mermaids and merman ornaments. Here you’ll find decorating tips for celebrating a tropical Christmas with mermaid themed decorations. What type of garland should you choose for a mermaid Christmas tree theme? Shell garland or pearl garland makes a beautiful accent to mermaid themed ornaments. Drape your tree with ribbon in ocean inspired colors or prints. Combine rope, netting, ribbon, and beads for a unique Christmas tree garland. The best Christmas light strands for decorating a mermaid tree are white, blue, or multicolored. 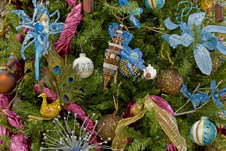 Ornaments come in a variety of styles and materials (glass, wood, ceramic, and crystal to name a few). Consider adding elements that complement this theme, such as ornaments made out of seashells, sand dollars, and sea glass. Complete this Christmas tree theme with a starfish or mermaid tree topper and accent the Christmas tree skirt with a nautical net.